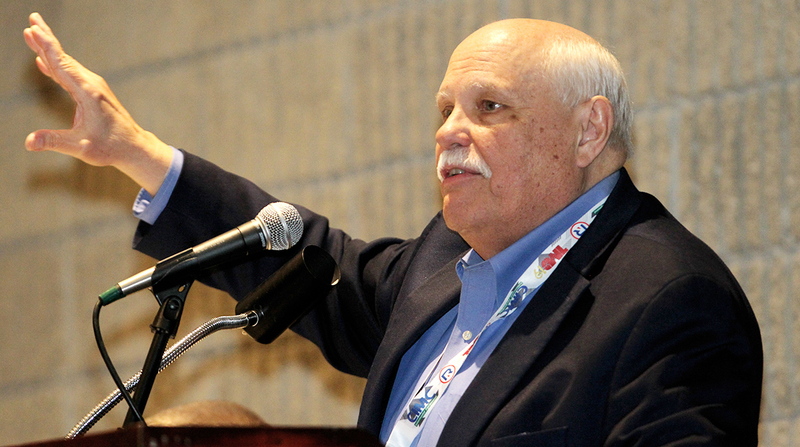 Joe Register, vice president of emerging technologies within the technology and standards department of the Auto Care Association, argued that members of the aftermarket industry should be able to access the same repair data as original equipment manufacturers. The Auto Care Association represents independent automotive aftermarket manufacturers, distributors, repair shops, marketers and retailers. Register spoke March 18 at American Trucking Associations’ 2019 Technology & Maintenance Council annual meeting. The session focused on a controversial issue known as “right to repair,” a sore spot among truck makers, independent truck repair shops and carriers who want to do their repair work in-house. TMC’s Right to Repair Task Force wrote a Technical Policy Advisory to offer ATA guidance in crafting policy on data ownership issues as they relate to maintaining trucks. According to the advisory document, U.S. Environmental Protection Agency regulations require manufacturers to share certain emissions-related service information with third parties and vehicle owners at a reasonable price to facilitate proper maintenance. In 2015, representatives of the aftermarket repair, trucking and engine-making industries signed a memorandum of understanding for sharing information pertaining to heavy-duty trucks made in 2010 or later. The MOU codified common practices for sharing diagnostic tool information with third-party aftermarket tool manufacturers. The MOU led to the establishment of the National Automotive Service Task Force, a nonprofit group made up of industry representatives that helps identify and correct gaps in information, service training and communication. Equipment manufacturers and technicians can contact NASTF for help with repairs if they can’t resolve matters with their local dealer. Register noted that data can be gleaned from a vehicle through telematics in addition to physical examinations. Drew Van Duren, technical director of internet of things security for OnBoard Security, said systems such as secure vehicle interface (SVI) can give a driver more ability to specify who has access to their data. OnBoard Security is a cybersecurity company based in Massachusetts. SVI is an in-vehicle system that facilitates data exchange between internal networks and external devices. “Security is really all about the authentication of individuals and entities connecting into your systems,” Van Duren said. The right to repair issue was at the center of a Massachusetts law signed in 2014 by Gov. Deval Patrick. The Massachusetts right to repair law prohibited any motor vehicle manufacturer, starting with model year 2013, from selling or leasing a new vehicle without allowing the owner to have access to the same nonproprietary diagnostic tools and repair information made available to the manufacturer’s dealers and in-state authorized repair facilities. In 2018, new legislation was introduced in Massachusetts that would expand the right to repair law so that owners, rather than manufacturers, would have the ability to determine where mechanical repair data is sent. Lew Flowers, owner of Flowers Fleet Services in Oklahoma City and chairman of TMC’s Access to Repair Information Task Force, said he plans to present the group’s information to ATA policy experts in the spring. “[The] objective here is to make it so that we can have a conversation about vehicle communication that isn’t unilateral,” Register said.